I made this Artist Birthday Cake for my Father In Law who was 80 in February and is an excellent artist. The round cake was chocolate, iced with fondant icing and the cake was made with a small Victoria sponge and iced with fondant icing again. I painted the edges of the book with edible gold pain. The bookmark I used was a piece of ribbon inserted into the icing at the top of the cake. The brushes were made with petal paste and painted (I used petal dust mixed with alcohol which makes a great painting medium) and I formed the paint palette around the little palette I use for cake decorating, again it was made with petal paste. 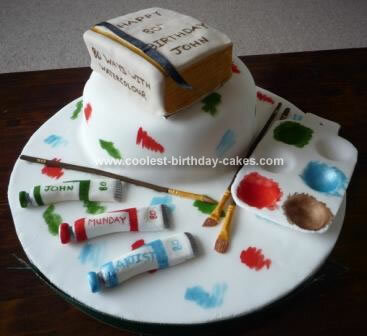 The tubes of paint were a 50/50 mix of petal paste and fondant. Because it was his 80th birthday I painted 80 on each of the paint brushes, and 80 on all the tubes of paint. I also called the book, ‘80 Ways with Watercolour’ (watercolours are his favourite painting medium). I used one of his painting supplies catalogues to copy the tubes of paint and brushes. He was really pleased with it.